Now closed; was a pub near Bond Street Station. 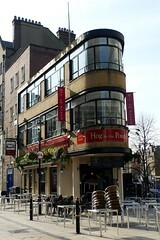 As of August 2011, Pubs Galore reports that it's no longer trading, and a June 2011 comment on Beer In The Evening states that it's being turned into shops. The London Architecture Blog confirms that it has indeed been turned into a shop. A pub near Bond Street Station, almost as close as you can get to Oxford Street without having Oxford Street as an address. It's part of the Capital Pub Company group. Howard found the well-kept real ale Hogs Back Brewery TEA (Traditional English Ale) there, from Tongham, Surrey. According to the Hog In The Pound website as of July 2008, food is served 11am-9pm Mon-Sun. Last visited by Howard, March 2008. Last edited 2019-02-07 12:52:43 (version 10; diff). List all versions. Page last edited 2019-02-07 12:52:43 (version 10).